Happy new year to you all!!!! I thought I would start the year exploring being beautiful. I believe as women we are all beautiful and unique in our own way. I believe as women we have an inner beauty and this should shine through on the outside with beautiful makeup and hair. What makes us beautiful inside and out? I think it is when we believe good things about ourselves. How many of us struggle with self worthlessness, not feeling valued, not feeling attractive but feeling ugly. How many of us have been told we are useless, will never achieve anything. We hate shopping for ourselves because we never look like what we think we are supposed to look like in clothes. We compare ourselves to others who seemingly have it all!! If we start to believe that actually we are worth something because we have been made for a purpose, if we are mindful in that fact that we are unique and therefore valued for who we are because there is no one on earth that is exactly like you. If we stop comparing ourselves and stop trying to be someone else and accept that we are wonderful, we might not be perfect but we are beautiful in our own right. Then that inner beauty will begin to shine on the outside as we begin to glow with the quiet confidence that comes with loving yourself. 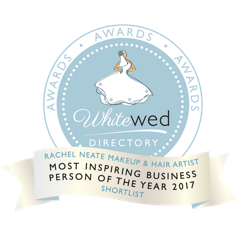 As a hair and makeup artist I have over the years come across brides that have hated to look at themselves in the mirror. A few times I have done trials and they can barely look at themselves. 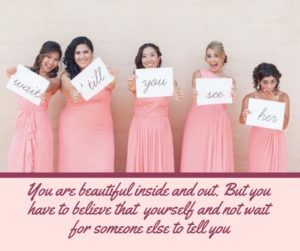 But when they have been told how beautiful they look on the morning of their wedding day by hair and makeup, Mum’s, Dads, relatives, friends, bridesmaids, they leave feeling beautiful and attractive for the very first time, they glow because they feel loved and have been encouraged. I am so privileged to be in a position where I can enhance someones natural beauty with lovely makeup products and be able to style their hair in a way that they may not be able to do. A wedding day is one of the most important days in a woman’s life and I would like them to feel beautiful inside and out. Finally I can’t say this enough. “You are beautiful on the inside and out but you have to believe it yourself and not wait for someone else to tell you”.